Enjoy the classic Cuban cocktail by adding rum and club soda, or leave out the rum for a refreshing ‘nojito’ that the whole family can enjoy. 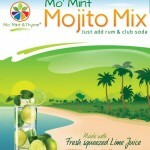 Our fresh, handcrafted mix will beat the socks off any commercial mix you’ll find in the stores. 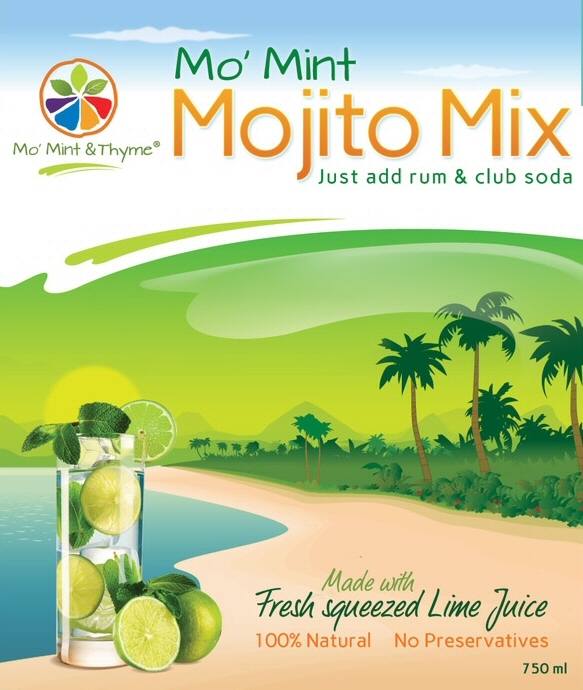 This non-alcoholic mojito mixer is made with fresh squeezed lime juice, organically grown mojito mint (spearmint) that we cultivate ourselves, pure cane sugar and filtered water. This versatile mixer can be diluted and frozen for a cooling pop or added to shrimp, fish or lamb marinades or dishes. This fresh product contains no added preservatives and should be refrigerated immediately after purchase. It will remain fresh in the refrigerator for up to 4 weeks. We ship the product in a styrofoam cooler with cold packs. 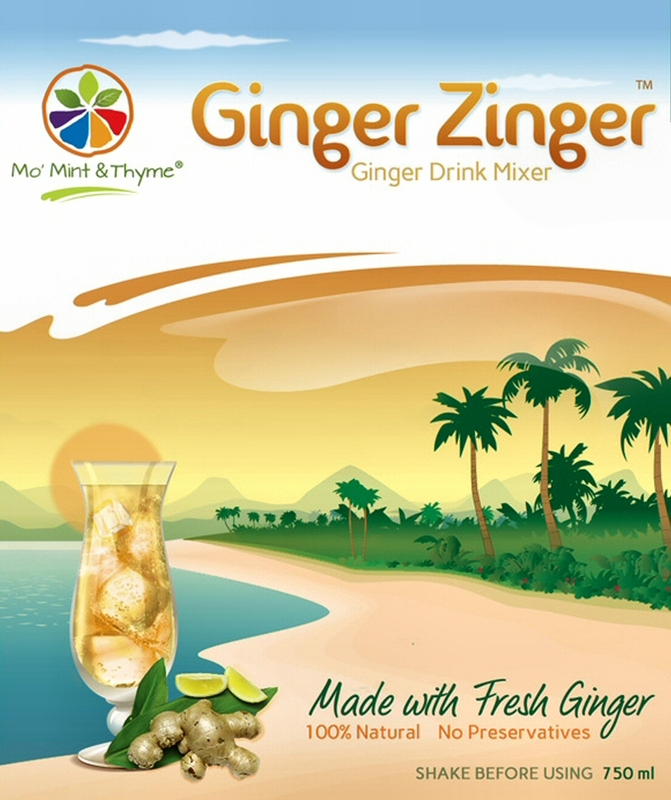 Inspired by a traditional Jamaican ginger beer, this is a fresh, all-natural, non-alcoholic ginger mixer made with the best quality fresh pressed organic ginger root, fresh squeezed lime juice, pure cane sugar, organic juniper berry, organic licorice root, organic allspice, organic cloves and filtered water. 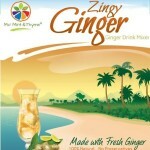 Mix our Zingy Ginger mix with sparkling water for a fresh, robust ginger ale or add a variety of liquor for some of today’s most popular cocktails. Heated with filtered water, the mix makes a warming morning cup-o or a soothing caffeine-free nightcap. 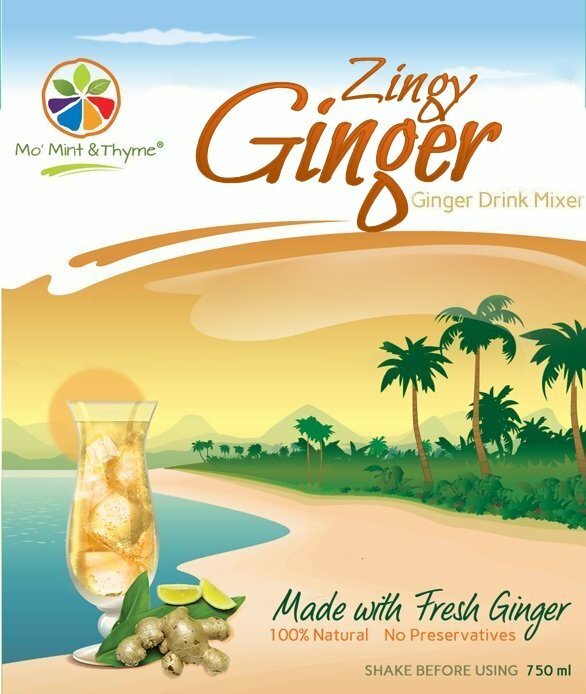 A superb mixer that offers the legendary health benefits of ginger and adds a spicy zest to a number of asian-inspired dishes. We also offer an optional sugar-free, unsweetened version of this popular ginger mixer. This fresh product contains no added preservatives and should be refrigerated immediately after purchase. It will remain fresh in the refrigerator for up to 8 weeks. 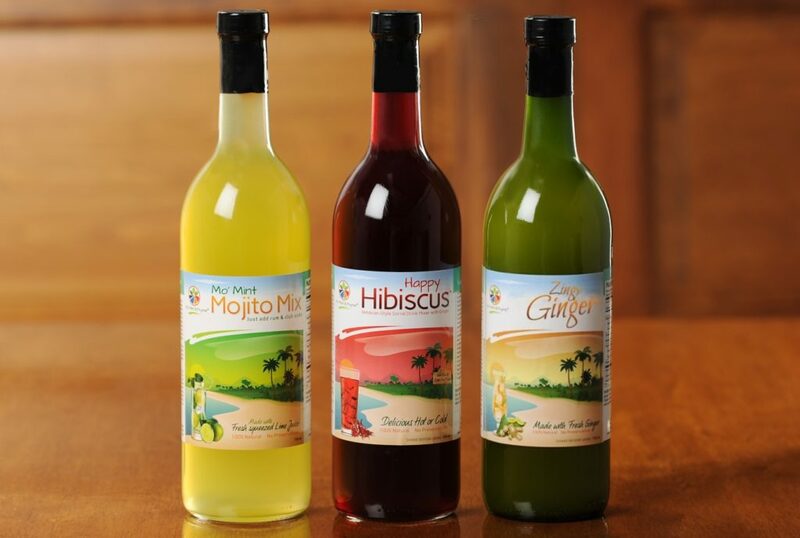 Hibiscus is enjoyed in beverages all over the world, but especially in the Caribbean (where it is called ‘Sorrel’), Mexico (‘Flor de Jamaica’), Egypt, the Sudan, and Latin American countries. 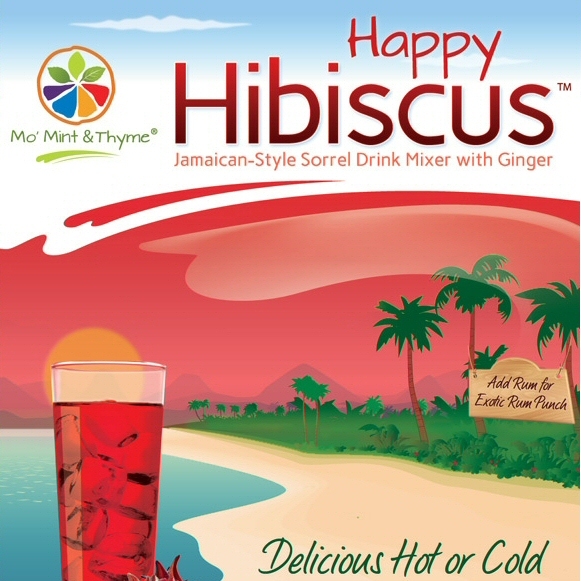 This Caribbean delight is made from the bright red sepals of the roselle plant, recognized for naturally occurring substances such as flavonoids, antioxidants, vitamins, minerals and immune-building properties as well as its ability to lower blood pressure. 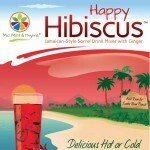 Fresh ginger, whole Jamaican allspice and cloves add an exotic note of spiciness to our Happy Hibiscus mixer which can be had cold or hot. A versatile cocktail mixer, it makes a delicious, mildly spicy rum punch with the addition of white or dark rum, a ‘hibiscus royale’ with champagne, and an exotic hibiscus martini with fresh squeezed orange juice, vodka and a splash of triple sec. Visit our recipe pages for some yummy ideas on using this versatile and healthy drink. This super-charged elixir is packed with anti-inflamatory, antioxidant, and immune-boosting properties. It combines freshly pressed organic turmeric root and organic ginger root with fresh squeezed organic lemons, then barely sweetened with local raw honey. Both turmeric and ginger boast several health-boosting properties, and lemon is no slouch either. Our turmeric ginger drink delivers a robust serving of all three. (An added dash of black pepper will increase the absorption of curcumin, the main bioactive compound in turmeric). This fresh product contains no added preservatives and should be refrigerated immediately after purchase. To optimize the health benefits of this fresh product, we recommend that you consume within a week. 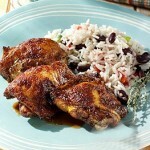 “Jerk” is an original, traditional Jamaican style of barbecuing that is popular the world over. Now you can jerk just like a native with our authentic Mo’ Thyme Jerk Seasoning, a premium blend of fresh, all natural herbs and spices. 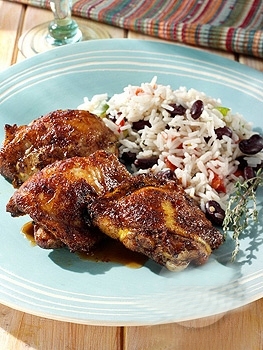 Unlike other brands of jerk seasonings, our fresh jerk seasoning is packed with all the flavor but just enough heat to make your jerk experience a delightful and memorable one. Furthermore, our fresh marinade has less salt and is made without preservatives or additives. Great on chicken, pork or fish, this unique seasoning will enliven soups, vegetables and even scrambled eggs. Our fresh and zesty wet jerk rub is made with aji dulce pepper, a smoky, flavorful but less fiery pepper than the customary scotch bonnet pepper. We do add a few scotch bonnets because it wouldn’t be jerk without some heat. Other ingredients are escallion, garlic, thyme, orange juice, Jamaican allspice, nutmeg, brown sugar and kosher salt. And we grow our own thyme organically in our Marietta garden!